Here is how the Voyager AI Engine is utilized within Pipeliner CRM’s primary features. Real account management means being able to access all pertinent information for an account, both broad and detailed. Through Pipeliner’s account management features, Pipeliner Voyager AI allows you to zero right in, and then out again, as needed. It provides a visual handle on all data so that it truly is instant intelligence, visualized. On a broader view, you need to know instantly how tasks and activities, for which accounts, are prioritized so that you and your team will make your sales target. Account management can also entail focusing in on types of accounts by profile types, and making changes across multiple accounts. Activity Stream displays on the right-hand side of the Navigator, and consists of opportunities, activities and tasks in date order, beginning with the closest to the present. Salespeople will often have reminders in different places and applications for all of these different items. Navigator brings them to you all in one convenient, visual location. Target Overview utilizes the Voyager AI engine to combine our Dynamic Target feature with a Target Trend graph. The user can see progress toward a sales goal–through three different metrics, over a specified time period. The user always knows where they stand with regard to the target, and what they need to do to meet or exceed it. Notifications, in which Pipeliner’s Voyager AI engine brings data into 4 different boxes: “Tasks”, “Missed Close Date”, “Velocity Issues.” and “Largest Open Opportunity.” Click on any of these to instantly drill down to specifics. Suggestions, through which the Voyager AI engine advises the user of other areas of action that should possibly be addressed, including New Leads, Stuck Opportunities, Inactive Leads, Inactive Accounts, Cold Accounts and more. Business Overview, through which the Voyager AI engine graphically displays Open Opportunities, Open Sum, Won Sum, and Lost Sum—for the user-defined date range to which Navigator is currently set. A CRM is only as valuable as its data—viewed visually, rapidly and in context. Through its powerful Filters and Profiles functionality, Pipeliner’s Voyager AI engine offers you many ways to visualize and instantly filter data so that you can have the precise view you need. Filter options allow you to filter and view tasks based on any field. Beyond that, Pipeliner allows you to save views that you know you’re going to regularly use—with our Profiles Feature. Pipeliner’s mission is to take visualization out of the imagination and into the real world, This mission is directly reflected in Pipeliner’s powerful graphic sales timelines, powered by Pipeliner’s Voyager AI engine. In the Pipeline View you have a graphic representation of your sales process, with its distinct sales stages. Within each sales stage you can instantly see exactly where each opportunity lies, along with how long it’s been there, if it’s overdue, its chances of coming in, and numerous other factors. If you mouse over any opportunity you can gain a Quick View—showing value, ranking, close date, recent and upcoming activity, and opportunity Fitness. In a similar way you can mouse over any sales stage for a summary of that stage, including total value, number of opportunities, average time in step, and more. 1To the right of the screen, always in view, is the Dynamic Target. It is a constant reflection of your up-to-the-minute progress in any given sales period, and can be utilized in 5 different target views. The Dynamic Target can also be customized to take different views of the pipeline for analysis and forecasting. With the Compact View feature you can, at a glance, view the last time a prospect was touched, the sales opportunities that involve them, and activity from their running feed (latest internal messages, social CRM updates or emails). The Compact View can also be applied to leads and opportunities. In which sales process stage does the deal reside? What is the estimated close date? How big is the deal, and what are its particulars? With Pipeliner’s 3D Timeline all of these aspects are instantly seen. Sales pipeline stages run up the left-hand side. The timeline runs from left to right, and the size of the deal is expressed in the size of the “bubble.” Simply mouseover or click on a bubble for a closer view of that deal. 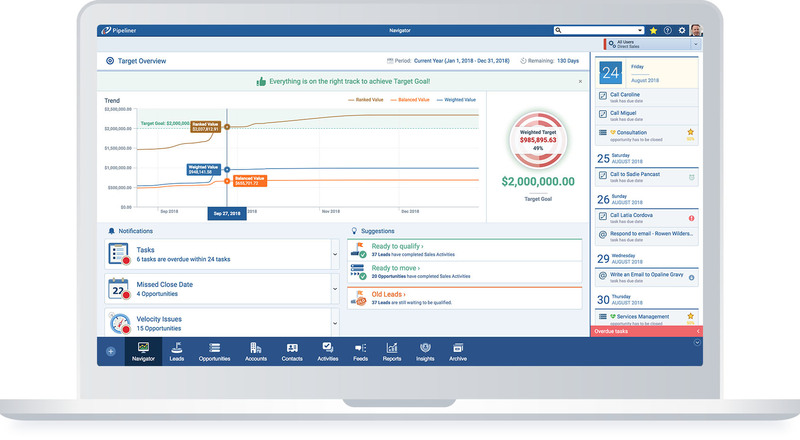 Pipeliner CRM now brings you complete timeframe understanding – instantly, visually. The opportunity is on target to close on time. There is an overdue task related to this opportunity. Fitness can be observed in numerous screens throughout Pipeliner CRM.